YOU ARE NOT ALONE. THERE ARE KIND AND GENEROUS PEOPLE OUT THERE WHO ARE WILLING TO HELP. This is meant to be a laymen's guide to help navigate and possible options that might pertain to your situation. Helping expedite the process of getting a unit through this programme. This information is based on previous experience of seniors in this situation. This not a guarantee of anything though hopefully, it can be of some help. Also always double check everything through the appropriate government agencies or organization. As every situation is different and policies are always changing. One does not have to be on Social Assistance to Qualify. You may Call to Apply 1-866-426-5191 for Rent Supplement Assistance Program. Outline of the Rent Supplement Assistance Program & How to Sign Up. Who qualifies for this program, what criteria are they looking at? ​For example, if you are a senior on fixed Income living in a crowded or inadequate dwelling would be one. NB Housing is separate from Income Assistance. plus Old Age Pension it would 30% of that income. Can I Work as Well if I am on this Program​ - Rent Supplement Assistance Program, NB - YES! Let's say you get a part-time job as a WalMart Greeter during the Christmas Rush. ​adjusted back to what it was originally 30% of your retirement income. In the Event of a Spouse Passing Away. Your rent will be readjusted and based on your income only. Funeral Home will fill the forms out for you - Death Benefit & Survivor's Benefit. No Forms to be Filled Out. The Assessment is Done over the Phone, call the Number above to Get Started. ​When Calling Have the Following at Hand. They will ask what you are paying for rent now. At some point will ask for a copy of your Tax Assessment to prove your Income. They will ask you to Fax it in. Important Information to Know as a ​Seniors on a Fixed Income. ​VERBAL CONFIRMATION ONLY - Of your present address, verbally tell them what you are paying for rent (no written authorization from the Landlord is required), Social Insurance Number, tell them what your income is, then they will ask you if you are a smoker, if you have pets, and if you have a vehicle (they need to know if they have any parking spaces available here in Sackville). When contacting NB Housing make sure you communicate to them how urgent it is that you find an affordable rental unit. All of your conversations are recorded, so they can look back and do a “Needs Assessment” case by case (e.g. if you are living in your car, then your need for affordable housing is greater than someone else who is not in dire straits and is staying with a relative and not paying rent). Also if one is OK with being flexible and living outside of Sackville, NB or relocating within the Province it can help expedite the process as well. You can have your name on more than one waiting list. For example be on a waiting list in Sackville and Moncton at the same time. Though each separate district requires a separate screening process. So when you are applying over the phone for Sackville it does not automatically put you on a wait list for other districts in the Province. 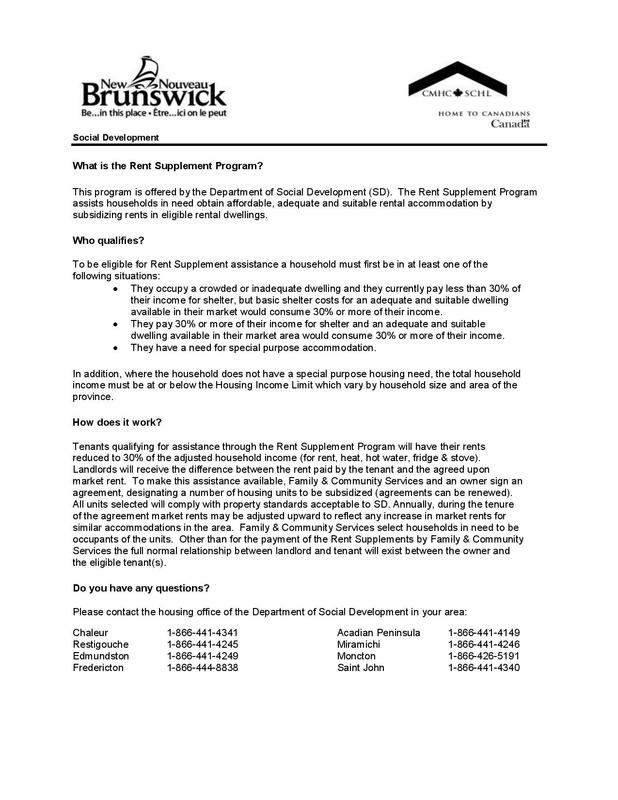 Social Assistance = Caseworker = White Card 6 Months = Unit/​Rent Supplement Assistance Program ! Yes it is basically a game of 'Cat & Mouse' e.g Bureaucracies. So be patient and remember every situation is different. so don't take it personally though sometimes it hard not to. - Phone into Social Assistance tell them you want to make an appointment that is it. - They will set up an appointment time so you can meet with a social worker here in Sackville, NB. - At that point, they will talk to you about your personal circumstance and best plan of action. - Fixed incomes for senior are low but they are not as low Social Assistance. In most cases, the social worker will tell you to keep your pension but will give you a White Card but it will only be good for six months. The White Card means you are now in the system/Social Assistance. Also you will have a case worker for six months. At this point call NB Housing and give them the name of your social worker. This gets you bumped up in priority in the Rent Supplement Assistance Program because you are now in the system because you have a White Card/Social Assistance but only for six months. We recommend that you call NB Housing once a week until you get your unit !!! When you talk to them always give them your social worker name. After you are done step one and two. Might need to go a Doctor. So, for example, might indicate to the Doctor having problems walking up and down the stairs where you currently live. Having difficulty caring your groceries or laundry up and down the stairs in the place you currently live. A common but serious problem that many seniors have. The Doctor at this point can give you a certificate/documentation saying you that can't go down and up the stairs where you currently live. Which means you can't live in the unit you currently live in because of medical reasons. ​Once you get documentation from the Doctor want to let Social Assistance/caseworker know this. Also, let NB Housing know this as well and that you have your documentation from the Doctor. Make sure once again to give them your case worker name as well when talking to them. You can drop of the documentation from the Doctor at the Social Assistance office in Sackville, NB. ​much quicker. Because it is now a medical issue. Also you already established you can't find a unit within your price range to rent on your income. Because you already went through the process with Social Assistance and NB Housing. Meaning you are already precleared for the Rent Supplement Assistance Program. Once again we recommend that you call NB Housing once a week until you get your unit. Congrads now you are actually in a Rent Supplement Assistance unit the only difference now is your rent will be 30% of your gross retirement income. Example if one is collecting Canada Pension Plan (CPP) plus Old Age Pension it would 30% of that income. ​Ms. Nadine Boudreau is responsible for Discharge Planning “Discharge planning is a crucial aspect of patient care. "It ensures that the same quality and frequency of medical care is provided in order to prevent re-hospitalization. The discharge nurse is the liaison between the patient and other health care providers in the community.” ​The person how does the Discharge Planning, for example, might give an assessment that could help a person be placed into The Rent Supplement Assistance Program, NB depending on the situation. This information is based on previous experience from seniors. We don't speak on behalf of Ms. Bourdreau or the Horizon Health Network. Rent Supplement Assistance Program. "Help for Seniors on Fixed Incomes." Provides assistance to households in need so that they may obtain affordable, adequate and suitable rental acommodation by subsidizing rents in eligible rental dwellings. Eligibility To be eligible forassistance a household must first be in at least one of the following situations: - They occupy a crowded or inadequate dwelling and they currently pay less than 30% of their income for shelter, but basic shelter costs for an adequate and suitable dwelling available in their market would consume 30% or more of their income. So Why is there such a Shortage for Subsidized Housing for Seniors on Fixed Incomes in Sackville, NB? The Catch 22 & NB Housing and Seniors on Fixed Incomes. The problem is that a lot of seniors on fixed incomes might look into Rent Supplement Assistance Program, NB that’s if they know the program exists at all. Then they are told upfront they will be put on the waiting list and it will take a very long time to get a place. At this point, a lot of seniors on fixed incomes will simply give up and not sign up for the program. As a result of this predicament, it ends up being a Catch 22 situation as NB Housing gets funds for rental units based on demand. So it is important that seniors on fixed incomes do sign up for the program, because once it is shown that X amount seniors on fixed incomes signed up for this program lets say in Sackville, NB. Only then will NB Housing be allocated more funds for rental units in Sackville, NB for seniors on fixed incomes. The Exception to the Rule! For other Supplement for Seniors on Fixed Incomes. There is a difference between legislation and policy. The legislation is intent and the policy is what they go by the caseworkers. ​Within the policy guidelines, there are able to look at individual cases and make exceptions to the rule without having to change the legislation. Though this individual deals with individuals already in this programme.